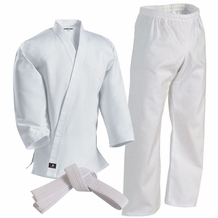 Taekwondo uniforms feature a v-neck design pull over top. 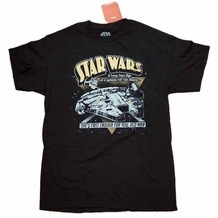 They are constructed from a lighter more breathable poly-cotton or 100% cotton canvas for greater flexibility. Taekwondo is known for its emphasis on high kicking and fast hand techniques, which distinguishes it from martial arts such as karate or southern styles of kung fu. However, the World Taekwondo Federation (WTF) believes that because the leg is the longest and strongest limb a martial artist has, kicks thus have the greatest potential to execute powerful strikes without successful retaliation. 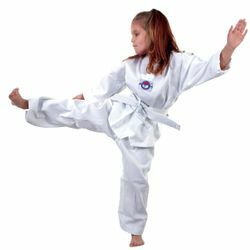 Taekwondo uniforms feature a v-neck design pull over top. They are constructed from a lighter more breathable poly-cotton or 100% cotton canvas for greater flexibility. V-neck Black uniforms are worn by Taekwondo instructor and black belts. 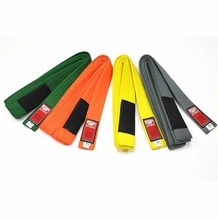 The new preferred material is the textured corduroy type material similar to most adidas taekwondo uniforms which offers greater moisture absorption.